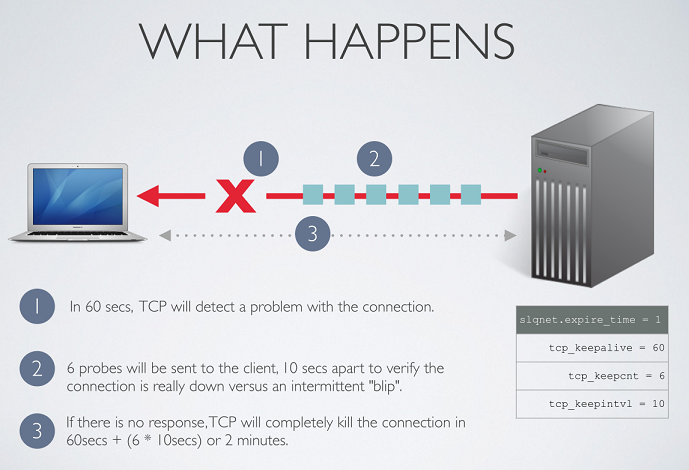 A not uncommon issue with firewalls and listeners are timeouts. Your production database may be behind a firewall, you may connect from a remote location, even your Windows workstation may have some firewall activated, possibly you use ssh tunnels or TCPS. All those occasionally lead to timeouts and connection abortion, for instance ORA-03113 end-of-file on communication channel, ORA-03135: connection lost contact, TNS-12547 Lost contact. I made until now a positive experience with this keepalive behavior, especially with SSL listener. The default value for SQLNET.EXPIRE_TIME is 0, so you must set it to a non-zero value first, the recommended value is 10 (minutes).